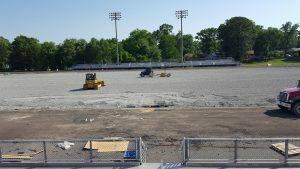 Project Description: This bond project will convert the existing natural grass football fields at all nine Henrico County Public Schools to tournament quality synthetic multi-purpose fields consisting of organic infill. The project will also provide for new collegiate rubberized track surfacing at all school sites by either milling of the existing track ovals or full depth asphalt replacement of the existing track asphalt. Existing grass D zones will be converted to rubberized track surfaces for track and field events. The construction projects will include site-work/grading within the existing football stadium ovals, underground drainage systems and storm water system improvements, and rework/replacement of the existing running tracks. Supporting construction activities required to complete the project will be included such as demolition work, earthwork/excess dirt removal, concrete and fencing work and compliance with the erosion and sediment control requirements. Sports furnishings to include goals, nets, and track & field equipment are to be provided as well. Stadium Field Images: Refer to the attached image for a field rendering showing field striping, midfield logo, and track colors. Schedule: The on-site construction for the first three high school projects (Douglas S. Freeman, Hermitage, and Varina) began January 2018 and will be completed by August 1, 2018. Engineering Firms: Prime Firm (Draper Aden Associates) – Civil engineering, POD and construction administration. CHA worked as a sub-consultant to Draper Aden Associates to provide the field and track sports design services. Construction Contractor: Sports Construction Management, Inc.